Now that spring is here the markets are overflowing with spring vegetables, and although the sight of them should cheer me it usually makes me feel rather guilty. They all look so fresh and pretty, and I know they are tasty, but many of them require a lot of preparation. Bamboo shoots need hours of work, butterbur requires 10 fiddly steps, and everything else needs soaking, parboiling, or other fussy preparation. So I tend to hurry by those edible heralds of spring and head straight for the year-round, fuss-free vegetables. But when I've got a little extra time to cook dinner I can be easily seduced, and when these greens called out to me, I answered. On the left is kogomi (fiddleheads) and on the right are some rather ratty-looking gyouja-ninniku, which I've never noticed before but looked a lot like ramps. Neither were particularly cheap, but at 130 yen for the kogomi and 300 yen for the gyouja-ninniku (reduced in price because they were a bit old) they weren't prohibitively expensive either. I'd never cooked with either, but I do know that kogomi is one of the few haru no sansai (wild spring vegetables) that don't require a soak in ashes or baking soda or other weird preparation, and as for the gyouja-ninniku, as a reader of food blogs I've been exposed to dozens of posts about ramps, and figured finding a recipe would be no problem. So into my shopping cart they went. It turns out that kogomi are from the ostrich fern, Matteuccia struthiopteris, prized all over the world; recipes abounded in both English and Japanese and the preparation was as easy as I'd hoped. The gyouja-ninniku, however, turned out to be Allium victorialis var. platyphyllum, which are different from Allium tricoccum, or what are called ramps or wild leeks in North America. Thinner bulbs and leaves, and the stalks were purple on only the outer layer, which had to be removed. But otherwise they are quite similar, both popping up for a brief time in the spring and much loved by gourmets, and I decided to go with a western recipe rather than a Japanese one. 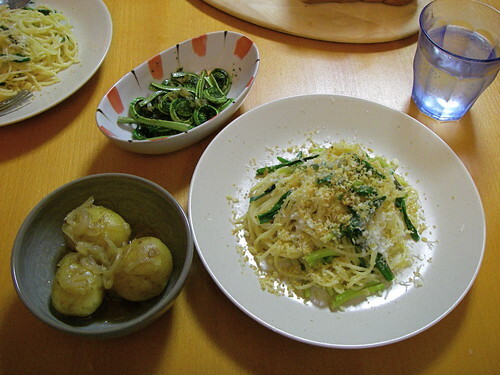 Dinner turned out to be a celebration of spring: new potatoes simmered with onions and dashi, fiddleheads sauteed with garlic, and spaghettini with ramps. The recipe for the potatoes is here, and I've just realized that new potatoes contradict what I said above about the difficulty of cooking spring vegetables: they are one of the easiest things in the world to cook, easier even than regular potatoes. So thank goodness for new potatoes. The pasta was based on the recipe described in this Gourmet article, which is actually more of a description than a recipe. I didn't blister the whites because they seem much more delicate than the more bulbous ramp whites, and I added a pinch of red pepper flakes at the beginning and some of the pasta water at the end. 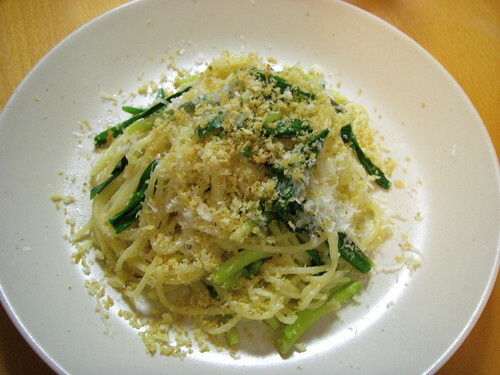 The bread crumbs were panko that I'd toasted with olive oil, and the cheese was grana padano. And normally when I read a description like I've just given, of all the substitutions and changes someone has made to a recipe (the comments that go with Epicurious.com recipes are full of hilarious examples), I imagine the results were awful, but this was delicious. The gyouja-ninniku didn't have any of the earthiness that ramps are said to have, and tasted like a mild version of nira (garlic chives). I'd like to try this again if I can find fresher examples, and am curious to see how they're prepared in Japan. 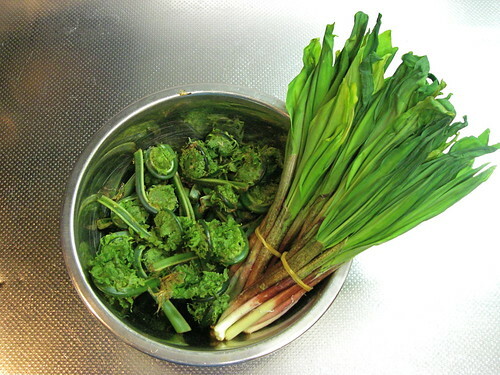 The fiddleheads were parboiled and sauteed in olive oil and butter with garlic and parsley, flavoured simply with salt and pepper. They were good and had a wonderful crunch, but tasted incredibly mild, with none of the bitterness I'd expected. I actually wish there was a little bitterness too them, or some earthiness or something (this has to be the first time I've wished a vegetable was more bitter). Obviously the parboiling had been unnecessary, so I'll try these again with a different preparation to see if I can get more flavour out of them. So what do you do with spring vegetables? 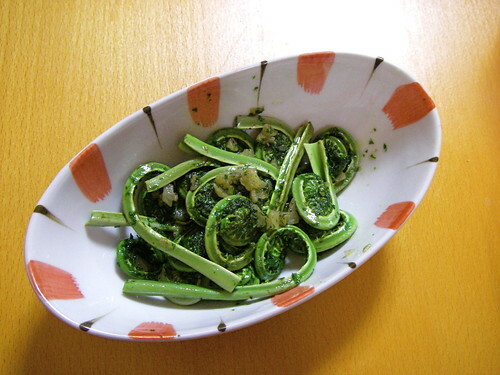 Fiddleheads are a Spring favourite in my house. I'm looking forward to seeing them in the markets, probably not for a few weeks though. Spring has only just sprung in Montreal. Such a wonderfully simple meal. So fresh! Wow, that's a really great bunch of pictures. Thanks for the information about the Golden Week festivities, as a foreigner myself I was not knowledgeable about the festival. I always laugh when I read the epicurious comments. It's always for something like "Garbanzo bean and kale soup" and they say "well, we didn't have the garbanzo beans or the kale. So I substituted kidney beans and spinach." Then they rate it badly and talk about how terrible the recipe was.